Ever since primitive agricultural man forsook the pointed stick for more sophisticated cultivating fools, the hoe, in its various forms, has been found to be indispensable. No gardener's arsenal is thought io be complete without it standard garden hoe, and many have found the weeding, grubbing, and scuffle types useful on occasion. Another type, the Warren hoe, has been unjustifiably neglected—in many areas it is almost completely unknown despite its practicality and remarkable versatility. The Warren hoe was originally developed to make furrows for planting potatoes, its unique design makes it admirably suited for this purpose. The blade is shaped like an arrowhead with a rounded tip and barbs, and in the stan dard model, it tapers throughout its six-inch length by curvilinear reduction from four and one-half inches at its base to the slightly rounded tip. In addition, the blade curves inward slightly toward the handle. It is longitudinally convex on the near surface and correspondingly concave on the obverse, with the thickncss of the metal diminishing from one-eighth inch near the base to one-sixteenth inch at the tip. Mounted on the handle with the usual gooseneck found on the common garden hoe. it is canted inward at about 20 degrees from the perpendicular for greater efficiency. This remarkable implement lias capabilities far beyoiid the purpose for which it was designed. It can penetrate both loose and partially compacted soil with ease. 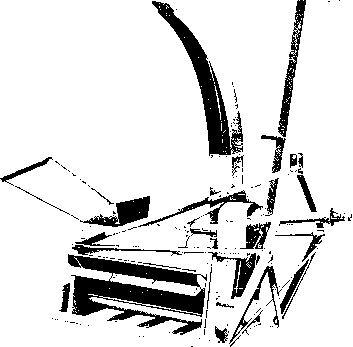 Often, only one solid whack is sufficient to bury its head well below the roots of an offending weed, and a gentle tug will expose the interloper in its tools for cultivation entirety. The pointed tip suits it admirably for pecking at the soil in conBned spaces, while the absence of any cutting edge makes it possible for one to work the surface near the base of plants without danger of damaging any tender roots. The Warren hoe is also an excellent furrowing tool to the depth of six inches, and when laid on its side with the point slightly depressed into the soil, it can be drawn parallel to a row of plants. It is also a well-balanced implement which lends itself readily to one-handed manipulation, leaving the other hand free to pick up and discard undesirable matter. This excellent gardening aid has only two limitations: it is not an efficient breaker of stubborn clods, and it cannot cut. For those purposes the common garden hoe is without peer. But for quick, clean cultivation, easy furrowing, and delicate weeding, the Warren hoe is a champion.